Astana was named the capital of Kazakhstan in 1994 by President Nazarbaev and officially became the capital in 1997. In just 21 years a lot has changed in Astana, as this place used to be a small, provincial city in the middle of the steppe. Now, it’s a big, futuristic city full of skyscrapers and other modern architectural structures. To be completely transparent; we weren’t the biggest fans of Astana and actually prefer Almaty, the former capital of Kazakhstan. Perhaps because Astana is so new and somewhat impersonal, with a lot of kitsch, golden buildings. Or perhaps because it was the end of our trip in Kazakhstan and we compared it too much with the great time we had in Almaty. Don’t get me wrong, we had plenty of fun in Astana and also did plenty of fun activities – the highlight being the Expo 2017. 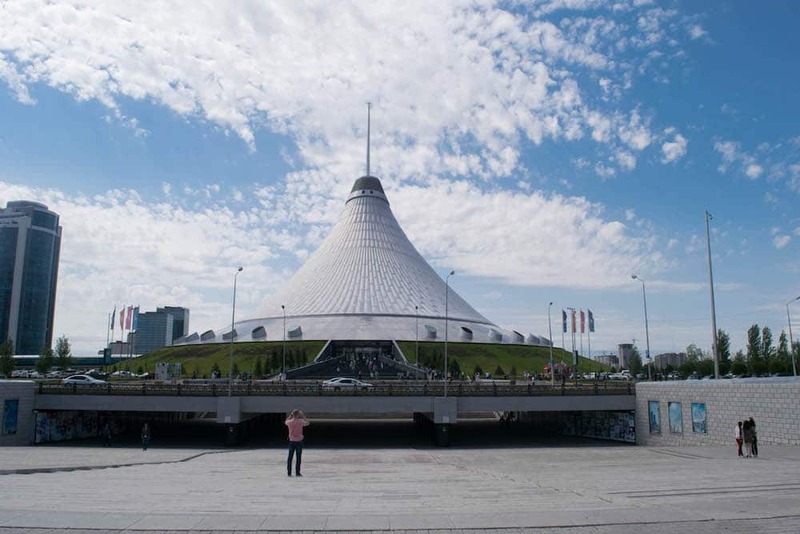 Below we share 10 things to do in Astana in this article. Furthermore, I also share where to sleep and eat. Definitely go and explore Astana for yourself and let me know what you think! Expo 2017 is what gave Astana international recognition. It was the highlight of our trip to Astana, as it was really interesting and educational, and the Nur Alem Pavilion, which you can see on the photo above, was actually a really cool building. The theme of the expo was “Future Energy” and aimed to create a global debate on how we can ensure safe and sustainable access to energy for all, while reducing CO2emission. 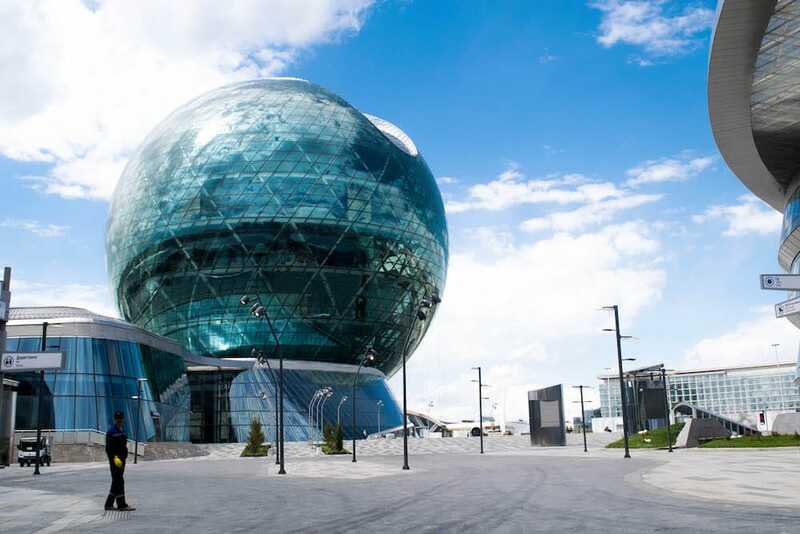 The Expo 2017 includes the Nur Alem Pavilion, Energy Hall, Educational Center, Exhibitory Complex, “Astana” International Financial Center, the Green Technologies Center, Art Center, IT-Technopark and the Congress Center. The only thing we really explored was the Nur Alem Pavilion, which is the central facility of the expo. 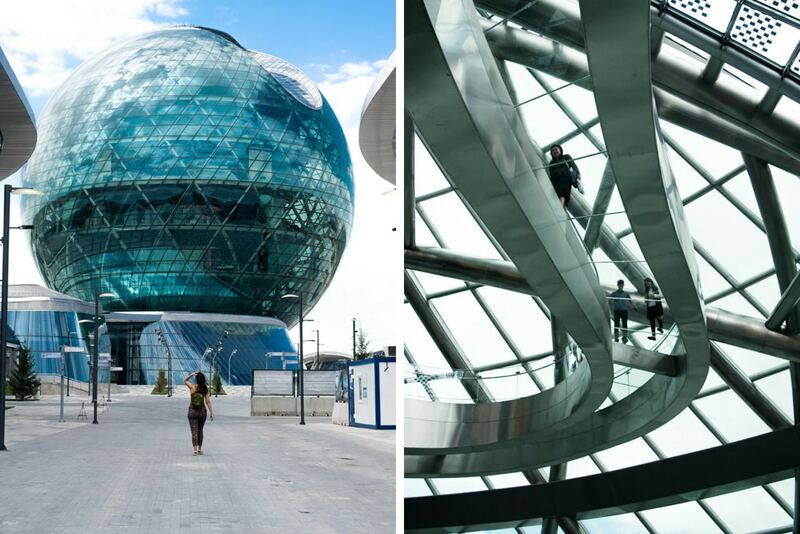 This building is the only building in the world that has a spherical form of the 80 meter diameter. There are 8 levels in the building that deal with various types of energy. On the top floor you can walk over a cool bridge with a see-through floor. The Bayterek Monument is a kitsch, golden building that represents the traditional Kazakh legend about a mythical tree of life and a magic bird of happiness. The legend tells that the bird, named Samruk, had laid its egg in the split between two branches of the tree of life. At Bayterek Monument you can place your hand in a print of President Nazarbaev’s palm. Bayterek Monument is a popular tourist attraction with both foreign and local tourists and is now a landmark of Astana. Near Khan Shatyr you can find the I Heart Astana sign. Behind the sign you have a building with a see through view of the Bayterek Monument. Even though it’s not more than just a sign, it’s a good spot to take some photos! As the sign is located near other points of interests in Astana, it’s easy to include in your itinerary. 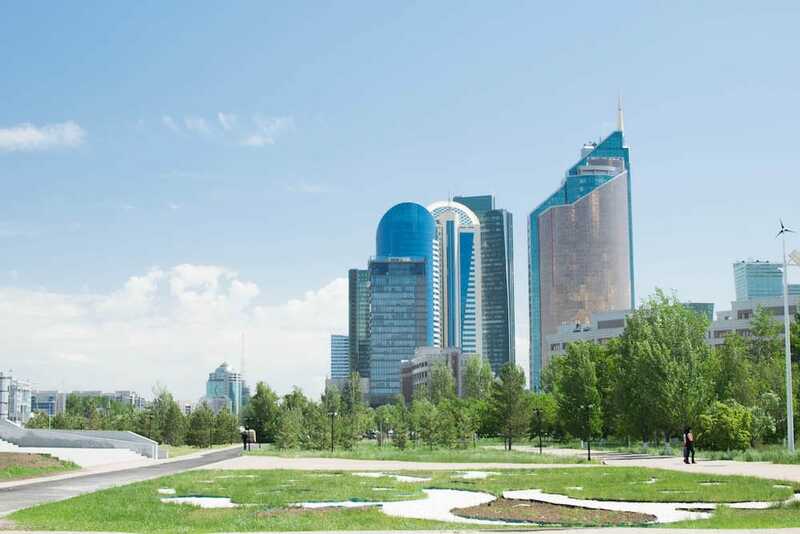 Near the I Heart Astana sign and surrounded by city buildings and monuments, you can find the City Park in Astana. Walk around the fountains and flowerbeds at this broad promenade. 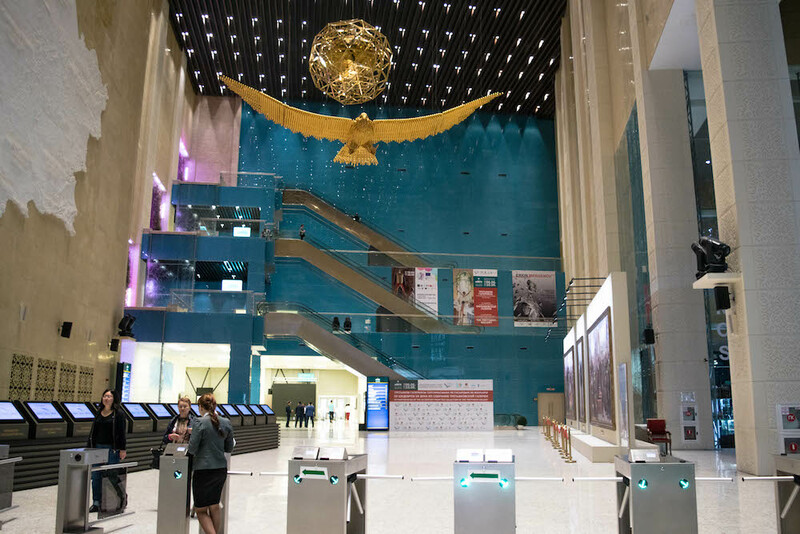 At the huge National Museum of Kazakhstan in Astana you can learn about the history and culture of Kazakhstan from ancient to modern times. There are countless displays and exhibits, such as a big yurt in the Hall of Ethnography or the Golden Hall that shows Bronze Age ornaments from the national symbol of Kazakhstan: the Golden Man. I though this big golden eagle at the entrance of the museum was also pretty cool. 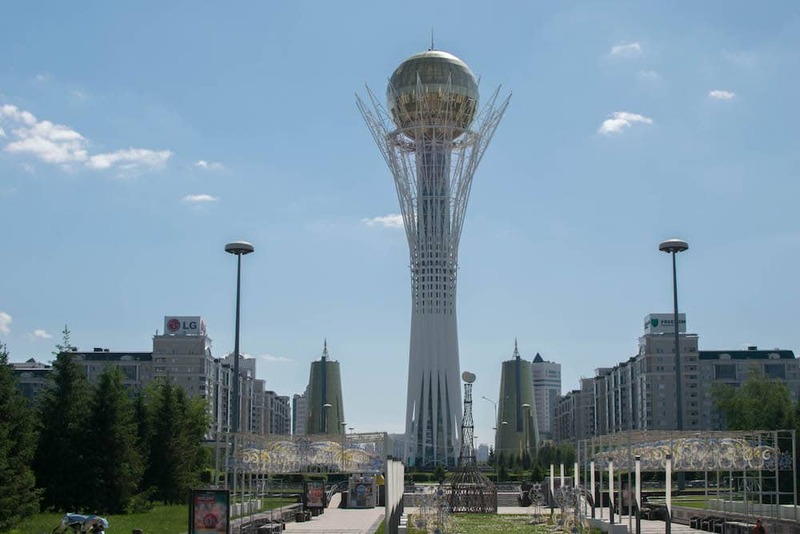 Since it was named the capital city of Kazakhstan, Astana has quickly grown to be a big, modern, futuristic city. A lot of the buildings in Astana are designed by international architects in a variety of Asian, Western, Soviet and unique, futuristic styles. Walk around and be surprised by the many weird buildings, such as structures that resemble a spaceship or a pyramid. 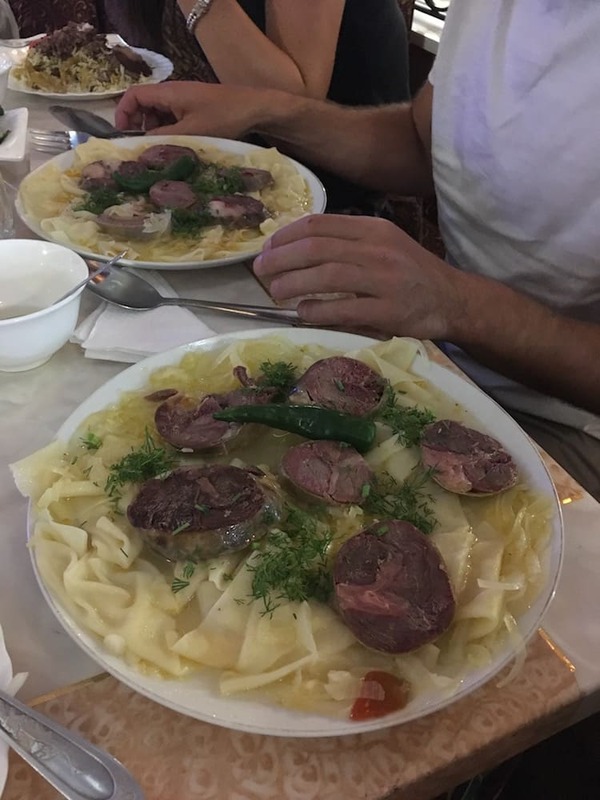 Personally, I do not eat meat myself, which is actually quite difficult in Kazakhstan because every dish contains meat, but if you do eat meat you can try Beshbarmak. This traditional dish is usually served in a big round bowl and usually includes mutton broth and comes with a sort of pasta dough. The dough is cut into squares and boiled in the broth. The term Beshbarmak means “five fingers”, because nomads used to eat this meal with their hands. The Palace of Peace and Reconciliation in Astana looks quite impressive on the photos we’ve seen. However, once we saw it in real life, it was a bit worn down and missing some of its granite triangles that cover the whole building… Such a pity! Nonetheless, it’s an interesting event venue that expresses the spirit of Kazakhstan. In Kazakhstan, cultures, traditions and representatives of various nationalities coexist in peace, harmony and accord and that is definitely something to be proud of! 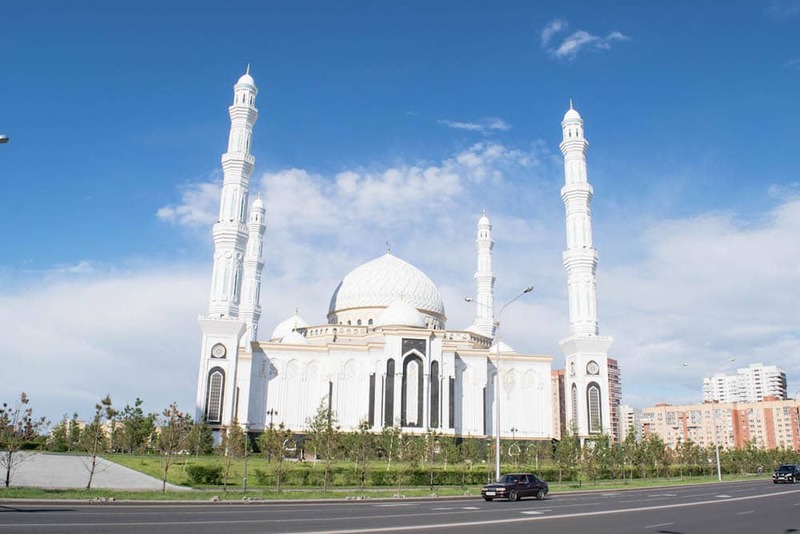 The Hazrat Sultan Mosque in Astana is the largest mosque in Central Asia and can accommodate up to 10.000 people. Hazrat Sultan means ‘Holy Sultan’. The building has a classic Islamic style with Kazakh ornaments. 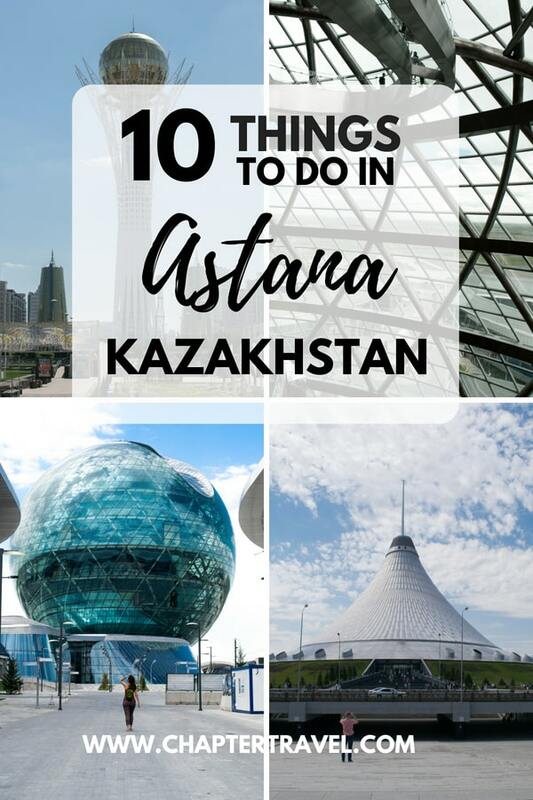 In our article itinerary for Kazakhstan we already shared some useful information for your visit to Astana, such as where to stay and where to eat. We’ll also share this information here in more detail. We personally stayed in Hostel Nomad 4×4 in a private room with a shared bathroom. Hostel Nomad 4×4 also offers dormitory beds. The location was great, near the Bayterek Monument and the Mega Astana Shopping Center. There was free WiFi that worked fine and the rooms were basic but comfortable. This stay is perfect for backpackers or travellers that don’t need much more than some basics. The staff was friendly. We just had one minor miscommunication on the day we were leaving, as we thought that they had offered us the rooms for half of the price for the day (we were flying in the nighttime). However, they meant a bed in the dorm room instead of our private room. The result of this was that we quickly had to pack our bags before check-out time. But, no harm done, as we could still stay in the hostel until we left! Like Hostel Nomad 4×4, Hostel Forum has a perfect location near Bayterek Monument, but even closer to the Khan Shatyr Entertainment Center. There is free WiFi, a shared bathroom and cooking and washroom facilities. It’s also possible to book a family room with a private bathroom and a bunk bed in a dormitory room. Hostel Ishim Astana also has a perfect location near the popular tourist attractions. There is free WiFi and a shared bathroom. Furthermore, the hostel has a restaurant that offers Middle Eastern food. It’s possible to book either a bed in a dormitory room or a deluxe room with a shared bathroom. This hostel is also similar to the previous options, as it has a great location near the popular tourist attractions, free WiFi and private and dormitory rooms with shared bathrooms. There is also free private parking available. Find out more here. The Square is a hotel, bit more pricey than the previous options depending on your dates, with a great location, free WiFi, a bar and a 24-hour front desk. The hotel features private rooms complete with bathroom, flat-screen TV and airconditioning. 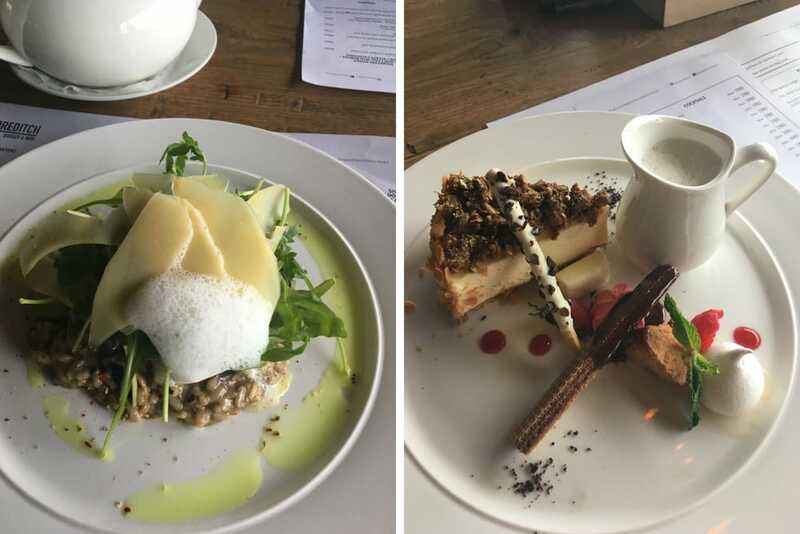 There is continental or Asian breakfast in the morning, a restaurant that serves European and Asian cuisine and dairy-free and halal options. Radisson Hotel: This five star hotel in the center of Astana is very comfortable and offers an indoor swimming pool, a gym, a sauna, a Turkish steam bath and a spa centre. King Hotel Astana: This four star hotel in the center of Astana offer big and comfortable rooms. I advice you to check out Airbnb. Sometimes there are pretty good deals in great locations. If you haven’t used Airbnb before, use this link for a discount! Astana is very multicultural, which means that there are all types of food to try! Below we share some favourites. The Shoreditch Burger & Wok: Here you can all sorts of cuisines, from Indian to European-style food. We tried their delicious curry’s and their amazing risotto. It was really good… The desert there was also epic. Pane & Vino: If you’re craving Italian food, be sure to stop over here for their delicious pizza’s and pasta’s. Yakitoriya: A rather weird place, as they seem to be serving pretty much everything (it’s a Japanese restaurant though), but it’s very affordable and the quality of the food is actually pretty good. I would advice to take multiple dishes, as they are rather small. Qazaq Gourmet: A perfect place if you want to eat Kazakh food. Korean House: Here they don’t only serve Korean food, but also sushi and other Asian food. 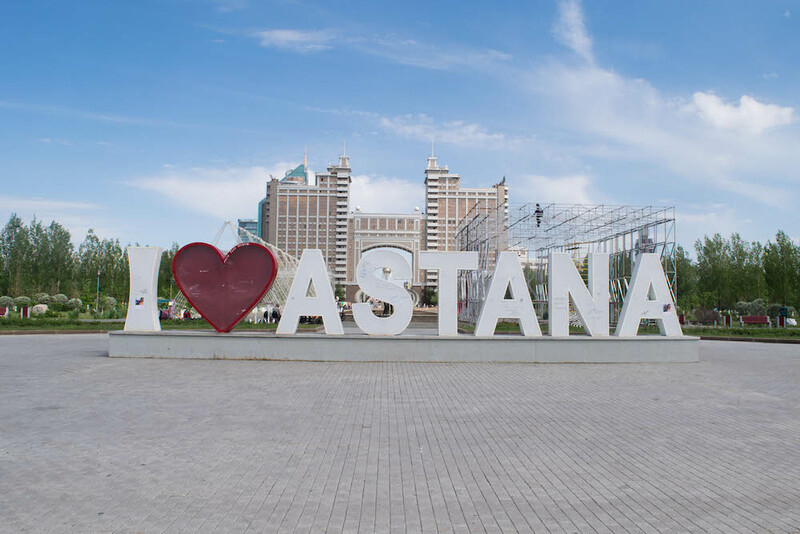 Have you been to Astana? Or are you visiting the capital of Kazakhstan anytime soon? We would love to know your experience! Great article. We will be there for 4 days so have noted some of your recommendations. We’re booked in the 4×4 also so are happy you enjoyed it! Great to hear guys! Enjoy! Thanks for posting this, Astana is on my bucket list and can’t wait to go there.